About a year ago, I read Meredith Jaeger’s book, THE DRESSMAKERS DOWRY, which was her debut novel. For a debut novel, it was good but needed a little more polish to shine. When this book came up for review, not only was I in love with the cover, but I was eager to see in what ways her writing had grown. The other reason I decided to review this novel was the location. As a teenager, I was fascinated by California beach culture. I loved the carefree, unstructured romanticism that made the west coast so appealing. It was like to ultimate endless summer so this book seemed to promise that little bit of magic that I makes me love the California coast. 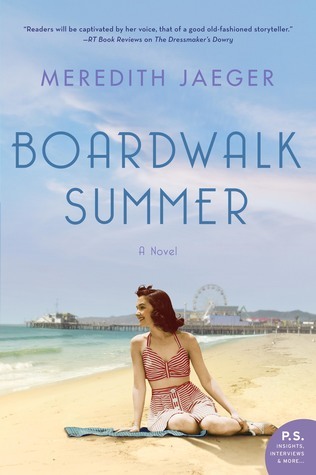 Summer, 1940: When Violet Harcourt is crowned Miss Bathing Beauty in her hometown of Santa Cruz, she’s determined to see herself on the silver screen. But Violet’s pageant victory comes with a price—cracks appear in her seemingly perfect marriage…and she quickly discovers Hollywood is not the glittering escape she dreamed of. So she makes a shocking choice, leaving her name in headlines and creating a mystery surrounding her fate. Summer, 2007: Single mother Marisol Cruz lives in a charming seaside cottage that belonged to her grandfather, Ricardo, once a famed performer on the Beach Boardwalk. Drawn to the local history of her town, Mari discovers her grandfather’s connection to a beauty queen who died too young. She embarks on a journey that uncovers his lifelong secret—Ricardo’s connection to Violet…a story of tragedy and courage that will forever transform her (summary from Goodreads). The first thing that I noticed about this book was how much the writing style had improved. While the story was still on the lighter side for me, the writing wasn’t lazy or lackluster. It was fun to see how Jaeger has evolved as a writer. I was also pleased to see that she maintained the same standard for historical research that she did in her debut novel. The little nuances of the period were well thought out, vivid and were applied where needed. The Santa Cruz boardwalk was so vividly portrayed in this book. Clearly the author loved this area and spent a lot of time recreating the feel of the boardwalk for this book. Well done and well researched. As I mentioned, this book was a little on the lighter side, which was expected for me based on the cover. The cover has a brisk, laid back, summer feel which fit perfectly with the story. There are two different time periods in this book, the 1940’s and the early 2000’s. I liked both periods equally. They both felt balanced and the stories were seamlessly merged together. There were a few too many coincidences but for the most part the story was believable and realistic—at least enough so that I kept on reading. Marisol and Violet were both intriguing characters and their stories were unique. Initially I found myself wondering how their stories were going to connect, because it seemed unlikely from the description. I was thrilled to seem them come together throughout the novel. Overall this was a great, easy, beach read for me. There were lots of little elements that I thought worked well together in the book and the cover is a beauty! Jaeger did a great job at capturing the nostalgia and magic of California’s beach culture!